David Price is one of baseball's best pitchers. For years the undisputed 'Ace' on the Tampa Bay Rays, he's now a key piece in the Boston Red Sox starting rotation. For nine seasons Price reliably made around 30 starts per season. That durability helped earn him the largest contract ever afforded a pitcher, a seven-year, $217m deal in Boston. However the narrative changed somewhat in 2017 when Price missed the first significant amount of time of his career. An elbow strain limited him to just 11 starts. This season he has struggled with a diagnosis of carpal tunnel syndrome causing numbness in his throwing hand. For pitchers, elbow and forearm problems bring grave concerns. The dreaded "Tommy John" surgery to fix a damaged ulterior collateral ligament can mean 12 months on the sidelines. Price missed months of action last term, but his diagnosis spared him the surgery. The explosion of Tommy John prompted Major League Baseball to approve a wearable solution for in-game use two years ago. MotusTHROW detects strain on the ligament after every throw and helps pitchers proactively manage workloads and guard against fatigue overuse. Price continues to take extensive measures to protect his elbow, but wasn't aware of the Motus sensor. "I have not used it," he said when asked by the Boston Globe in April. "I don't know how they measure stress on the elbow." A wearable solution for pro problems? Price appeared to be a prime candidate for the advanced Bluetooth sensor –featuring a 3-axis accelerometer and a 3-axis gyrometer – which sits within a compression sleeve. Price is a veteran player, keen to extend his career and with a huge financial incentive to do so. He's also renowned for his best form eluding him during the play-offs at the end of long seasons. Has the firm reached out to him? "We haven't," said Will Carroll, Motus' director of media relations. "We don't reach out to players that much. It's honestly not a priority for us. Some people just aren't comfortable changing their game day routine in any way. If you gotta wear your lucky socks to win, wear your lucky socks, man. "David is just an old school pitcher and that's fine. He's a heck of a pitcher. Not everyone is going to like the product or want to use it. We think it would have benefit for him. As he's aged, he has had those injuries, we want to help him stay as healthy and effective as possible." However, it appears Price is far from the exception among big league pitchers. The company can't tell us how many are using it, beyond its spokesperson, Yankee reliever Dellin Betances. The Globe article says "almost none" are using it in games. Carroll goes as far as to say: "It's less than we'd like to see." Motus is experiencing greater adoption at lower levels of the game, especially at the collegiate level. 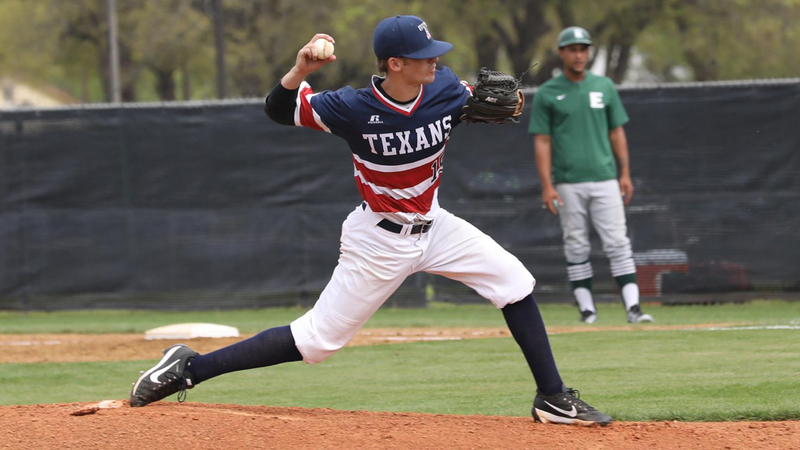 Tarleton State University in Texas is equipping its entire pitching staff with the sensor, which offers metrics like throw count, arm speed, arm rotation and the position of the elbow in relation to the body. Bryan Conger, the team's head coach, told us: "We've recorded every single throw we've made from 1 October until the end of our season in mid-May. "It really helped us to individualise each pitcher's throwing program. There were definitely times when the Acute to Chronic Ratio (see video below) reading might have been elevated, so we would adjust our throwing on a day-by-day basis. In the past it would be like "this is what we're doing" and we never really knew where their arm was. "The more we used it, the more the kids became comfortable with it and the more they started seeking the knowledge. The relationship between coach and players changed. We were having conversations about A/C ratio and how to put together a throwing program. Some of the players who've gone away to play summer 'ball have continued to use it to manage their workload." Despite its partnership with MLB, Motus was developed in part to halt the epidemic of UCL injuries among younger pitchers who're spending more time on the mound than ever. Conger is just one of the coaches who've reaped the rewards at collegiate level. Despite this success, does he understand why Major Leaguers might be more reluctant to embrace the technology? "I understand their initial skepticism, because they don't want to change a lot of what got them there and that's understandable. The reason we're more open to explore in the amateur area is we're trying to help athletes get to that level." While Motus could help pitchers proactively guard against career-shortening injuries, some are concerned about how the data could be used against them by their own teams. "It could turn into something they want to use against you," said Price's Red Sox teammate Drew Pomeranz. His efforts to stave off elbow ailments include experimental stem-cell treatments, using bone marrow extracted from his hip. "Some stuff is too much information. There's a place for all of it, I think. It's not just, 'Oh, that's bad,' but relying on some of this stuff is a little too far." The distrust stems from a natural fear that the information could be used to low-ball them in future contract negotiations. Currently, metrics like declining velocity and accuracy can come into play. If teams could detect that pitching arm is less able to endure strain or is susceptible to injury that would doubtless also be a factor. "There's still some resistance there because of the collective bargaining agreement [the agreement between players and the league on revenue and pay] just because they didn't anticipate data sharing." Conger adds: "They've got to protect the information they need to protect." Price's reluctance comes down to a feeling that, following a decade in the pro ranks, he knows his body better than anyone. This data could upset a rhythm, he says. He told the Globe: "I think you're going to feel it if something like [elbow stress] is going on. If you're feeling good and throwing well and get negative feedback from that, I think that might mess with you and cause you to change something that might lead to your shoulder hurting or back hurting. You might do something different that you're not accustomed to, just because you've got results on that that you weren't expecting to get even though you've been throwing the ball well." Conger, who will continue to use the Motus sensor with all of his pitchers next season, says it's welcome if the Motus sensor delivers news of undue strain on the elbow, even if it's not good news. He says: "Once we know these things, even if it's not great news, it is good news because now you can take a course of action. When they get to a point where they can look at it that way, they'll open themselves up to it a little bit more." All of these variables – superstitions, distrust of the tech, and a trust in their own bodies – have limited Motus adoption among MLB pitchers. However, the sensor is flourishing at youth levels, both with teams and individuals. Is this gap between the youth and pro ranks the same in other sports? We focus so heavily on the tech that can help athletes become elite, perhaps we don't pay due attention to those who've already reached that level? The makers of the Whoop Strap have an agreement with the NFL players association, and tell us that adoption rates have been "quite positive". Perhaps a major difference is the teams don't have access to that data. "Since our partnership is with the players association," founder and CEO Will Ahmed told us, "the players own the data and they know that. It's 100% up to them as to what they want to do with it. That's what's makes this partnership such a groundbreaking one – at its core it's about empowering the athletes with data." STATsports, the company behind wearables embedded at EPL clubs like Southampton plus NFL teams, has just signed a groundbreaking deal with US Soccer. "If you bring 50 guys into a room, you're always going to get different opinions and different levels of uptake," founder and CEO Sean O'Connor told us. "In the main, sports stars want to get better." Right now, until the tech is fully adopted by teams and legislated for in future collective bargaining agreements, player uptake will come down to individual preference and perhaps need. The long-term outlook is positive though, Conger says. "Once [the pitchers] have an understanding of how it works and how it can help them, I think we'll start to see guys trust it a little bit more. It'll probably help them extend their careers a little bit longer. This is going to change the way we look at a lot of things." Perhaps the real breakthrough comes when those healthy young pitchers using Motus make their way to the majors. Others are already discovering Motus when it's too late. Will Carroll of Motus adds: "Several of the top doctors doing shoulder and elbow surgeries [are] strongly recommending our product as part of rehabs. We wish people would use it before it got to that, but I hope that's not how David learns to use our product."